Cast your minds back to 14 October 2015. Two very special Ferraris were sold at auction with all the proceeds going to the Royal National Lifeboat Institute. That was the bequest of long-time Club member Richard Colton who owned the fabulous pair, a 250 SWB and a 275 GTB/4. 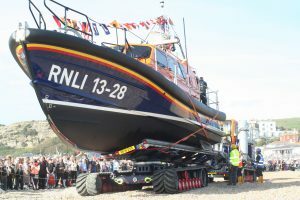 They made nearly £9m which went to the RNLI to fund a brand-new pair of lifeboats, the first one of which has now been delivered. It is named after Richard and his wife “Richard and Caroline Colton”. The weather just got better and better as the time drew closer for the arrival of RNLB ‘Richard and Caroline Colton’ and at 12.00pm the sun shone on Hastings – a fitting tribute! The RNLI put on a fitting display with the old Mersey class poignantly leaving to collect the new arrival. She has history, being the prototype Mersey class, having served for 33 years, the oldest boat in the fleet, not been refitted for 11 years and still looks brand new. What a testament to the station! “Richard and Caroline Colton” is going to be well looked after. We also saw for the first time the launch / recovery vehicle “Richard and Mark Colton” and you’ll see a picture attached of the first time the two were brought together. They are now all together figuratively speaking, being looked after by a deserving station to help save many lives at sea. Richard, Caroline and Mark rest in peace – what a legacy. 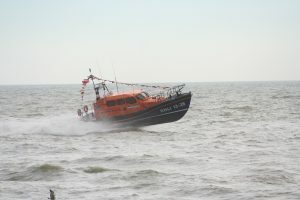 The RNLI pulled out the stops with a TAMAR, ATLANTIC and D Class boats welcoming the arrival of the old and new. It wouldn’t surprise me if over 2,000 people local people turned out to watch the arrival. We witnessed a display of “Richard and Caroline Colton” going through her paces. I hope the attached leaping picture gives a feel – twice as fast as the old boat, yet the technology within the cabin with their shock absorbing seats mean that they don’t feel anything even when jumping like this. That means “full speed” whatever the conditions – something Richard would appreciate. Then the landing – full speed up the beach – what a sight! We were allowed in the boat after she had been washed down and spoke to the new Coxswain who had driven (probably not the correct sailing term) from Poole. He is just “blown over” by what she can do, whilst at the same time protecting the crew. Two more weeks, once everyone has been trained she’ll become operational and starting to save lives at sea for the next 50 years! It has been an emotional journey, one I have been proud to have been associated with. We have raised the single biggest legacy, a world record price for a SWB and fulfilled Richard’s wishes as stated in his will. Thank you so much for all of you who made this possible but that’s not the end as you all achieved so much more than even Richard expected. …and then spending the rest of the legacy in a way that continues to honour Richard’s incredible gift to the RNLI.